Dogs are regularly put down when they are believed to be harbouring the parasite which causes the illness and death in humans. Globally over 350 million people are at risk of infection with an estimated 300,000 cases annually, and approximately 3,500 deaths each year in Brazil alone. Although therapeutic drugs are available there is no vaccine. Dogs harbour the parasite which can be transmitted to humans after sand flies bite the animals, so any infected dog is put down. 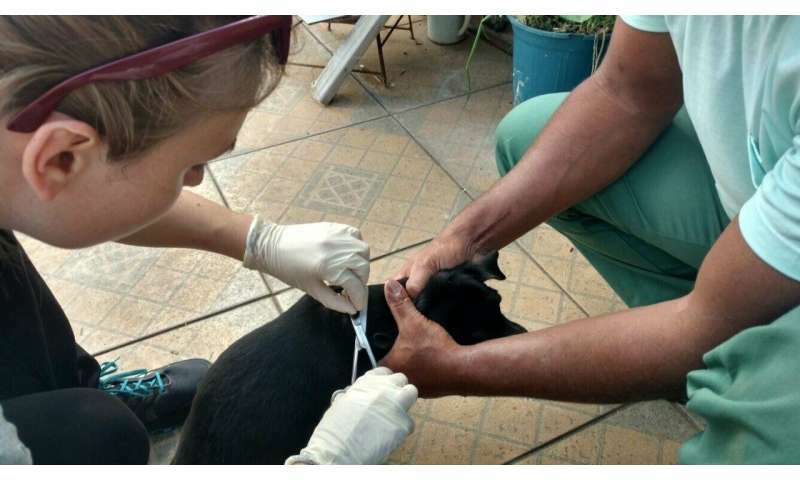 Ph.D. student Monica Staniek from Lancaster University in the UK witnessed this first hand in Brazil when she met pet owners who had brought in dogs suspected of infection. "One lady was really upset and in the corridor crying and it was very upsetting. Some people even hide their dogs." It is difficult to identify very accurately all the infected dogs that are passing on the parasite to sand flies and this means that many healthy dogs are put down. Now a team led by Professor Gordon Hamilton of Lancaster University in the UK working with a company called RoboScientific has shown that a new test based on the smell of infected dogs – using an electronic Nose- has an accuracy of around 95 percent. "We collect some hair from the dog and test it in our kit which we call an "electronic nose". This can "sniff" the odour of the hair and, it can tell if the dog is infected or not. "It's important that our approach can detect the parasite even if the dog looks healthy. It's easy to spot a sick dog, the problem are the dogs which look well but aren't. "It also means that infected dogs can be identified earlier so they can be removed before they transmit the parasite." The e-nose approach seems to be highly reliable, simple to use and is non-invasive, as there is no need for a blood sample. Its development also opens up opportunities to diagnose Leishmaniasis in humans and to test for other tropical diseases such as malaria, trypanosomiasis and Chaga's disease.